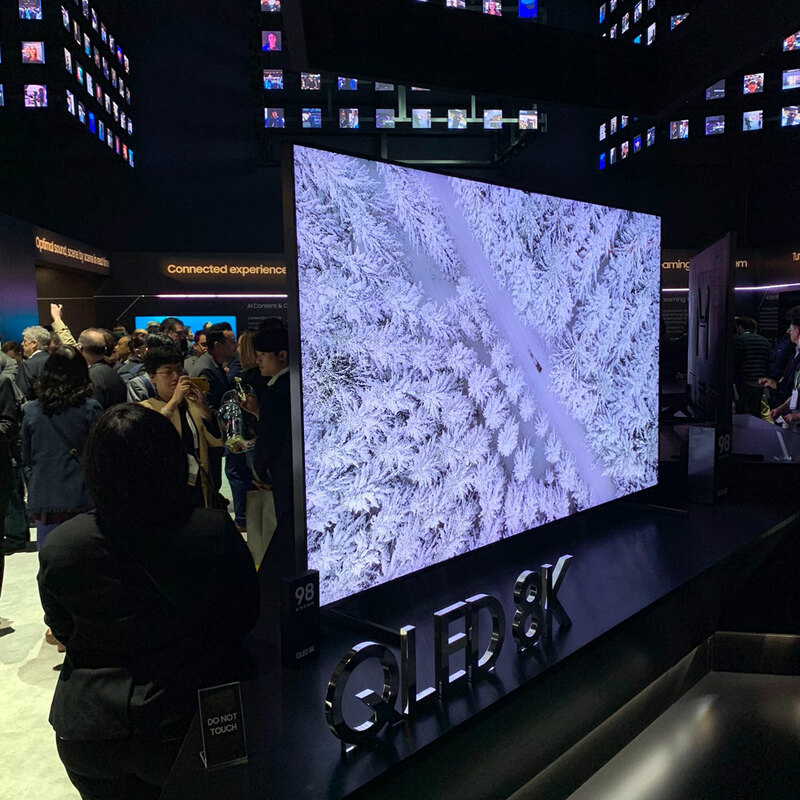 At CES 2019, Samsung gave us a first look at its 2019 4K and 8K high-end LCD TVs that will offer improved video processing, wider viewing angles, full array local dimming, Apple features, and more. Here are our first impressions along with technical information. The TVs were not final so Samsung was reluctant to comment on model number (“2019 Q9” for now), design elements, and specific features. 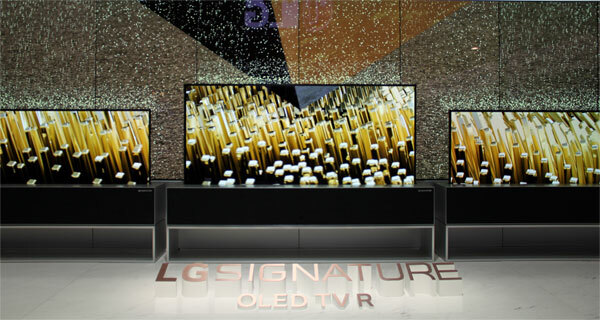 As such, the new high-end TVs were not showcased on the open show floors. The Korean company was, however, very eager to talk about and show off its latest picture quality improvements. We were not allowed to take photos during the ‘Innovation Room’ session so all photos here are from the open booth area. - “If it doesn’t happen this year, I will no longer work for Samsung,” one of the Korean engineers joked, referring to improved viewing angles. So let us start here and with this one particular improvement that impressed us the most. You may recall that Samsung a few years ago unveiled “QLED” LCD TVs with much improved viewing angles at CES. These improvements never made it to the actual products but this year it will happen for sure, Samsung promised. At CES 2019, we witnessed very visible improvements in viewing angles. Samsung was claiming “3x better” black level (at 60 degrees) and “2x better” gamma (at 60 degrees) compared to the 2018 Q9FN. This is good news as it has historically been one the major disadvantages of the VA LCD panel type that Samsung has been using in almost all of its LCD TVs to date. Sony has tried to solve it through a combination of filters and optics but Sony’s technology unfortunately affected black levels on Z9F (ZF9). Samsung appears to taken a different approach by adding a layer in the display stack. From what we understand, a prism layer concentrates light before it reaches the liquid crystal (LC in LCD) pixels to prevent light leaking into adjacent pixels. It is a new LCD panel design. Not all details are known but it seemed to work very well as black levels and colors remained fairly consistent off-axis – and it did not seem to affect black levels. Samsung is calling the technology “Q wide angle”. The viewing angle demonstration was carried out on the 2019 4K Q9 that will succeed the current Q9FN. 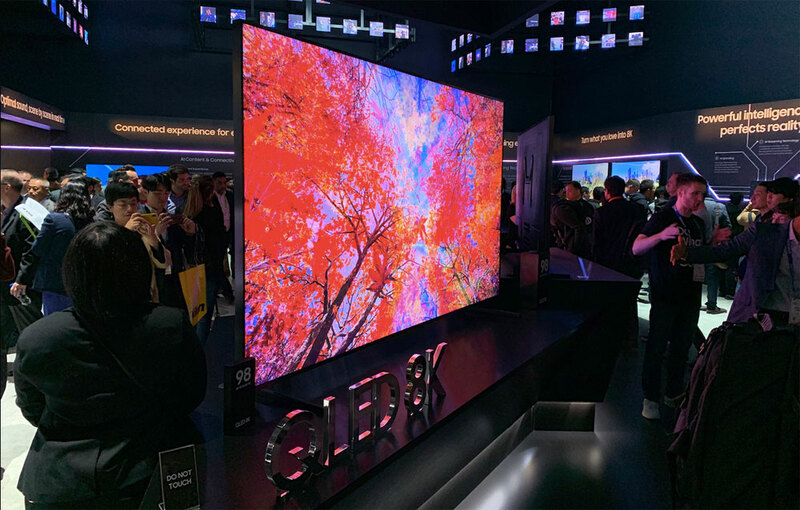 Samsung said that its 2019 8K LCD TVs (likely to be called Q950) will use the same technology but the company’s 8K demos focused on other aspects of picture quality that we will get to in a moment. 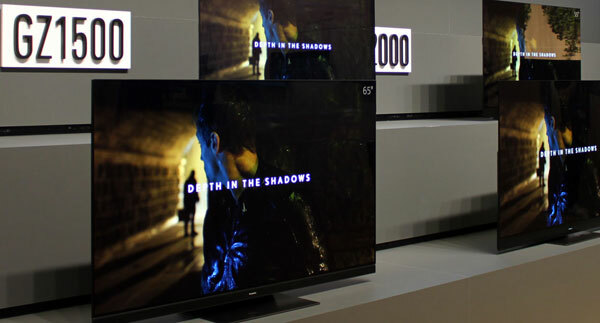 The 2019 LCD TVs will have full array local dimming LED backlights but it sounds like the number of zones will be identical to last year’s models (around 500). 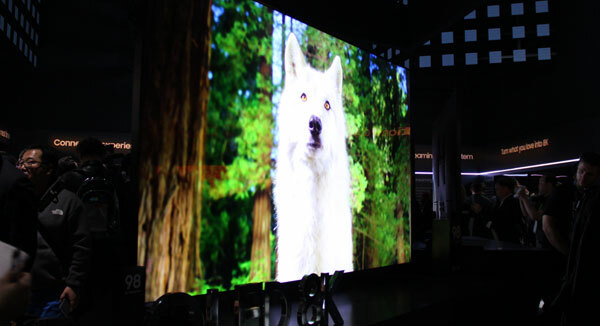 Samsung is claiming improved blacks and shadow details through improved zone dimming but the Harry Potter clip (Voldemort army scene) used at the demonstration revealed that a 2018 OLED TV still delivers picture with more depth and better luminance control (four TVs were compared side-by-side). The take-away here is probably that Samsung has improved things compared to the 2018 panel but on the other hand a mostly black scene is not the biggest challenge. The challenge with black levels and HDR on LCD displays is maintaining blacks – and contrast – in scenes of complex composition. 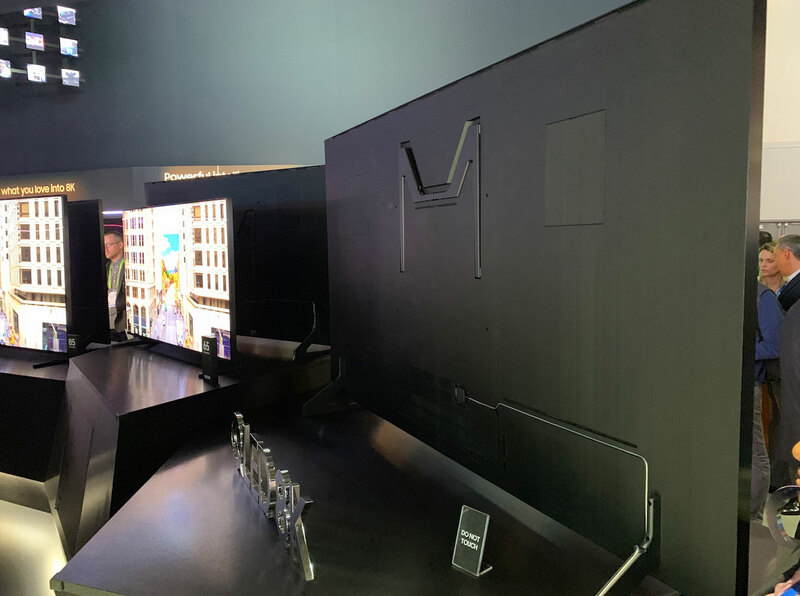 Samsung also said that its 2019 Q9 will have “higher-bandwidth” HDMI ports but it did not elaborate other than saying that it will be capable of receiving 4K120 (at 4:2:0 chroma). More information will be provided closer to launch. Samsung spent a good portion of the presentation talking about its work on “AI” picture processing and upscaling. “AI” is mostly a buzzword for machine learning and pre-defined algorithms (that can be updated) but in the end all that matters is the visible result. FlatpanelsHD thoroughly examined Samsung’s claims of “AI upscaling” in our Q900R review and found it to be mostly an exercise in applying sharpness around objects in the picture through various means. 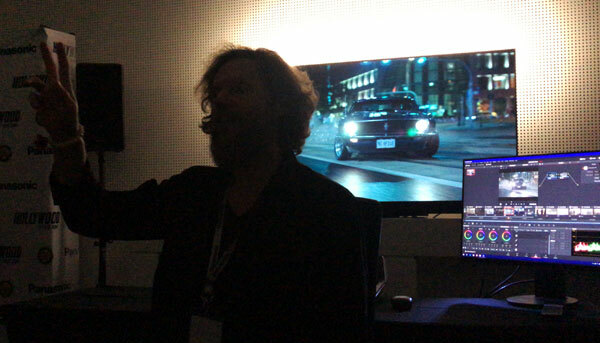 The 8K processing demonstration in Samsung’s back-room took this to the next level by trying to smooth out gradients, reduce noise, and apply other “enhancements”. For this purpose, Samsung was using its 2019 8K TV (likely to be called Q950R). The end result was a picture with details that looked so smudged and objects that looked so artificial that it made even beautiful nature scenes look almost cartoonish. At first glance – from a distance – it did look a little more detailed but moving closer or fixating your eye on an object, you quickly realize that it is just applying tricks. It is next-level “shop mode”. The trick book has a new chapter and as a consumer you should be vigilant. Remember that a TV manufacturer’s customer is in fact not you but rather the dealers. That is why most TVs continue to be optimized for shop mode rather than the picture standards that have made all of this possible in the first place. Hollywood hates motion smoothing but just wait until they see “AI picture”. Luckily, you can deactivate all of this stuff. On the other hand, the system was quite effective in reducing compression noise and banding in video content. 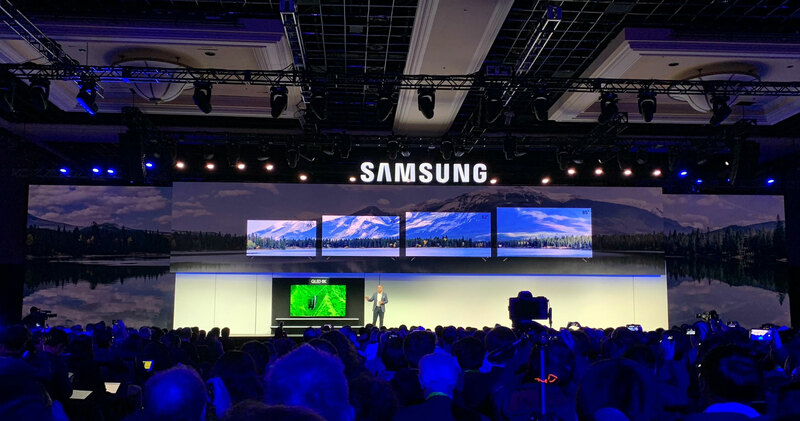 Besides the 2019 8K TVs, the processing will come to at least some of the 2019 4K TVs, Samsung said. We saw a short clip in 8K from a blockbuster movie and it made us think. There was a far more interesting 8K demo inside. We are not allowed to mention the movie by name but the message was that Hollywood is already underway in remastering movies for 8K. We saw a short clip in 8K from a blockbuster movie and it made us think. 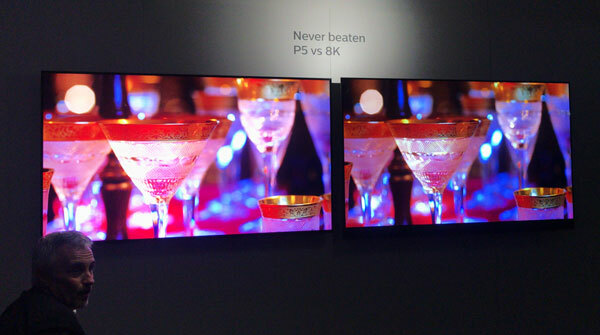 Most of the new 8K TVs at CES looked gorgeous, so crisp that pictures sometimes look almost three-dimensional. The TVs display beautiful time-lapses shot by some of the best people in the industry. And they use stills or slow-motion sequences. However, that is not how we enjoy video in our living rooms. We watch sports, action, and drama. We hook up our TVs to game consoles. Like most other movies, this particular movie was shot in 24fps and as soon as the picture started moving it became a mess of blurriness. Some of it may be attributed to the slow nature of LCD response time but we suspect that most of what we saw during the brief demo can be attributed to the source. It is a subject for another time but we think that this whole “24fps movie look” discussion will reach a tipping point as we transition to 8K resolution. At some point, Hollywood will need to start adapting its content creation process for TVs’ technical capabilities rather than the lowest common denominator, which – for the picture side of the equation – is cinema. It is very unlikely that our saviors will be found in traditional Hollywood studios. Even after Disney launches its streaming service, its main business will continue to be the box office. Who has the courage to break with tradition? Of course, this is not specific to Samsung’s 8K TVs but it puts this whole 8K transition into perspective. Continuing to chase higher resolution is pointless unless frame rate increases drastically – perhaps even beyond 120fps for 8K. And that sort of summarizes our experience with 8K TVs so far. They look great on the showroom floors but we are simply not convinced that time is ripe. Samsung confirmed that its 2019 8K TVs will have HDMI 2.1 ports but said that they will not have 48 Gb/s bandwidth. The implications are not clear because Samsung was, again, reluctant to provide further information but the company did say that its 2019 8K TVs will be capable of accepting 8K60 input via an upgraded OneConnect box that will, at least in some regions, be made available to owners of the 2018 Q900R. To round off its back-room session, Samsung wished to demonstrate improved gaming performance. 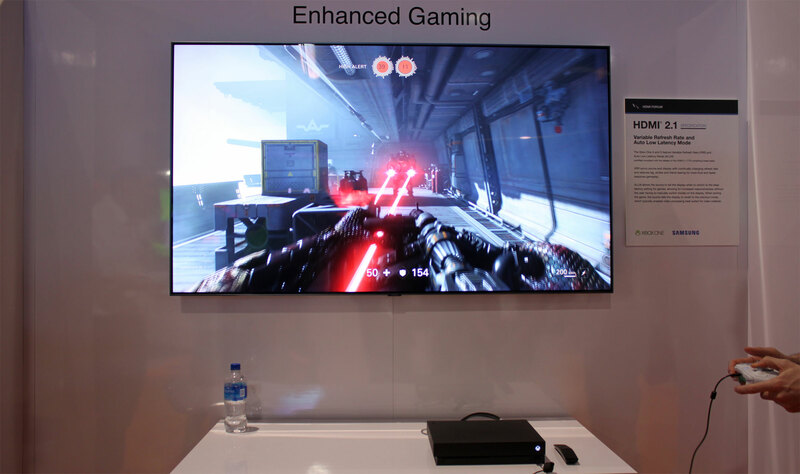 Last year, Samsung became the first manufacturer to offer support for variable refresh rate in TVs and Microsoft implemented support in its Xbox One S/X. The 2019 TVs will support HDMI VRR in addition to FreeSync 2. This year, Samsung has reduced overall input lag to 13.5 ms, which together with LG’s 2019 OLED TVs represent the lowest level of input lag for non-VRR inputs – unless other brands have something up their sleeve. Samsung TVs will offer a new picture setting that elevates shadow details to make them more visible. While this is not consistent with how the game creator wanted you to experience the game, Samsung argues that it may be desirable for competitive reasons so you can spot enemies hiding in the dark. This feature is tentatively named ‘Dynamic Black EQ’. The company also touted its partnership with Apple to bring Airplay 2 and an iTunes app to its TVs. Neither of these features was functional in the TVs. When trying to open the iTunes app it simply said “coming soon”. This picture is all we have for now. 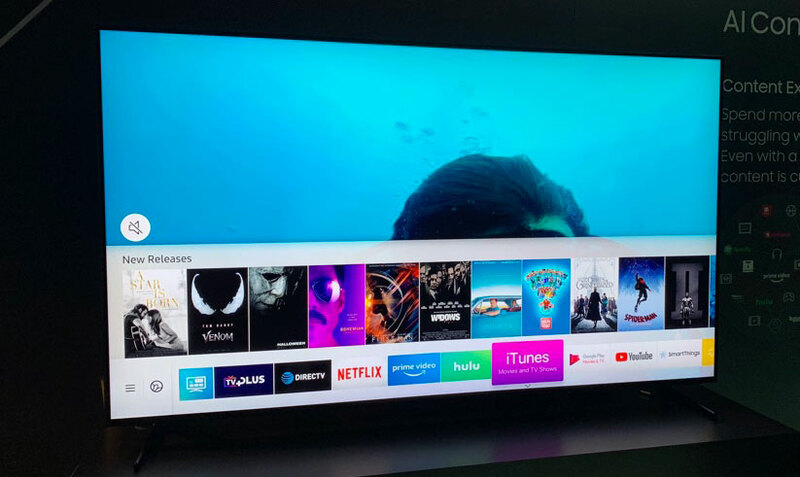 Airplay 2 will also come to 2018 Samsung TVs with the Tizen operating system through a firmware update but plans for the iTunes app were less clear. It may or may not happen on 2018 TVs. Another tweak this year is that Samsung TVs will display a HDR10+ logo in the infobar whenever video playback is in HDR10+ format. There has been a lot of discussion on this subject so it is nice to see Samsung address it. The company also demonstrated that Amazon is indeed streaming video in HDR10+. Since the infobar has been deactivated for the Amazon Prime Video app, Samsung has also added an HDR10+ indicator on top of its picture mode icon. Samsung also talked sound. Like "AI picture", it has developed an “AI sound” function that analyzes the type of content and tries to enhance it in various ways. There are also built-in microphones that analyze surroundings. It did make the sound stage wider and more encompassing but we will need more time with the TVs to properly evaluate it. The TVs will still an external One Connect box, and will feature improved Bixby 2.0 voice controls along with support for Google Assistant and Amazon Alexa via an external speaker. Samsung’s 2019 TV line-up will be announced later and FlatpanelsHD will bring you all the details so be sure to subscribe to our newsletter.